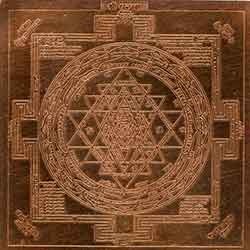 MAHA MERU SHREE YANTRA OF COPPER MADE BY CNC MACHINE WEIGHT 60 KG AND SIZE 18 BY 18 INCH. Variable sizes available . Ask for various designs and depends upon Yantra. The Yantras are offered to the clients to solve their issues and empowering them with positive mindset. These Yantras create positive aura around you and your family to guard you against ill effects. Bring home spirituality and serenity with powerful Yantras. We excel in offering Sri yantra to our patrons from across the country. We offer Shirodhara Pot/Yantra (Copper). A shallow Copper pot with beautiful brass chains and 'S hook to hang to a hook/stand for shirodhara oil treatments. Pot with oil capacity of 2 l is fitted with cotton wick for oil flow. Pot with hammer marks has a bright natural finish. 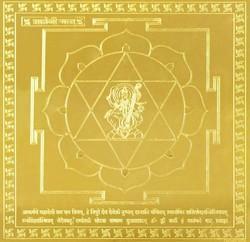 - The Yantra is made of copper with Gold plating. India's highest selling Max, with 4 big copper triangles on top for better results.